peace – chriscondello This work is licensed under a Creative Commons Attribution-NonCommercial-NoDerivs 3.0 Unported License. I think I should start this off by explaining why in the hell daffodils and Hostas are teamed up in a society together, that was my first question, why in the hell wouldn’t it be yours…The answer is actually brilliantly simple… Daffodils come up early in spring and bloom through late spring, the Hosta begin to grow in late spring and cover the spent daffodils. 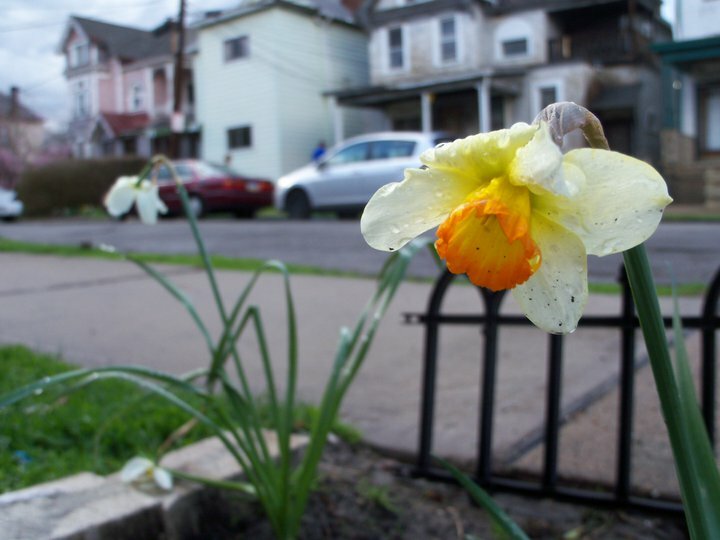 One of the requirements of growing healthy bulbs from year to year is letting the plants whither away on their own, the energy it absorbs after flowering is directly related to the bulbs ability to over winter and flower the following year. 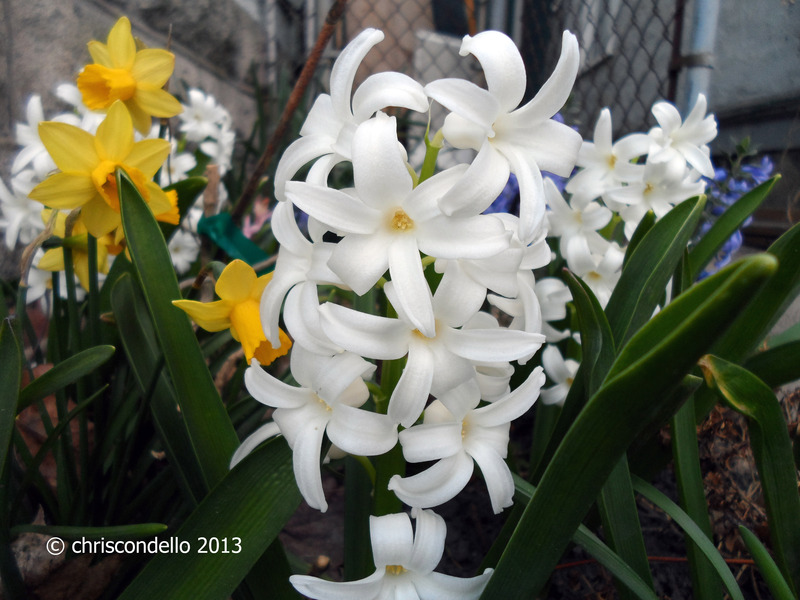 Narcissus is a genus of mainly hardy, mostly spring-flowering perennial bulbs in the Amaryllis family. 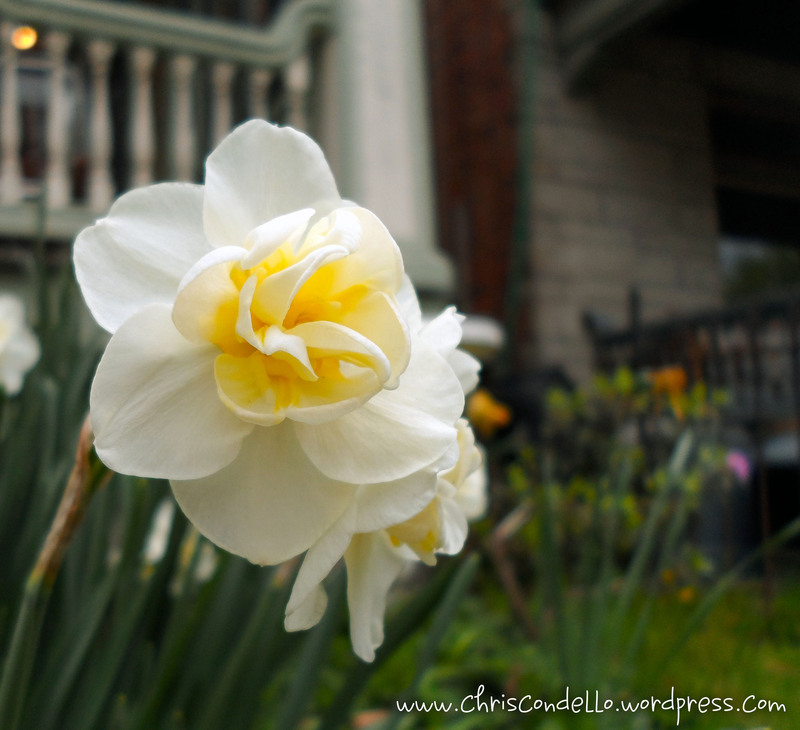 Common names include daffodil, narcissus, and jonquil are used to describe the genus. The name Narcissus is frequently linked to the Greek myth of Narcissus, who became so obsessed with his own reflection that he knelt and gazed into a pool of water, he eventually fell into that water and drowned. In some variations, he died of starvation and thirst. 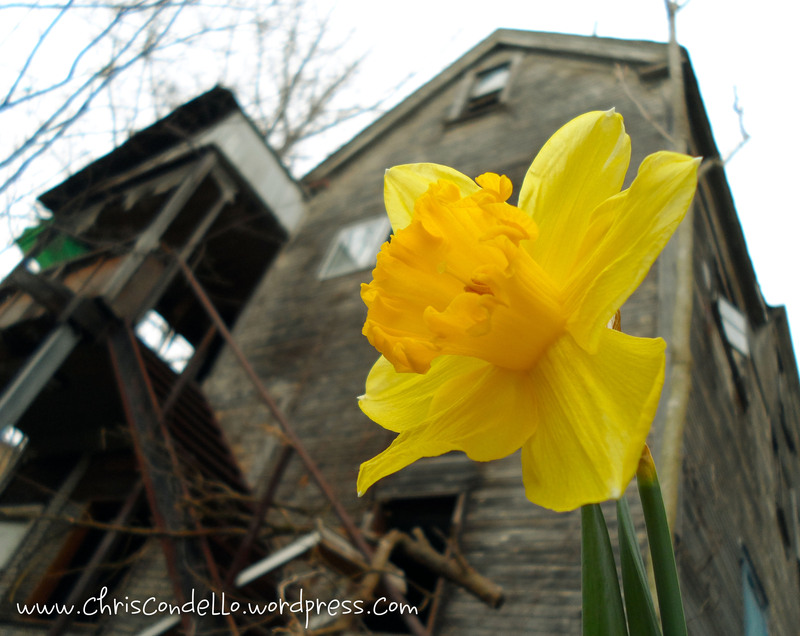 In both versions, the narcissus plant grew from where he died. 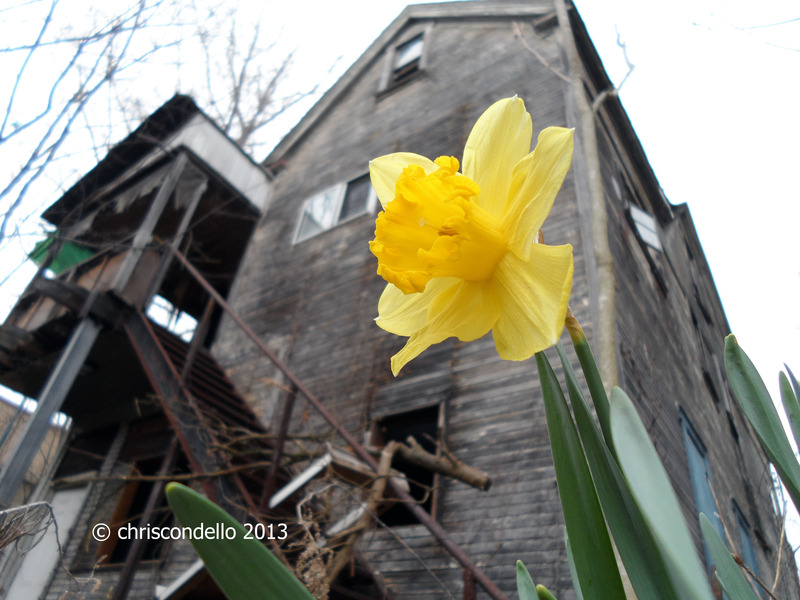 All Narcissus species contain the alkaloid poison lycorine, mostly in the bulb but also in the leaves. May 1st, 2009 a number of schoolchildren fell ill at a primary school in England, after a daffodil bulb was added to soup during a cooking class. The bulbs can apparently be confused with onions, thereby leading to incidents of accidental poisoning. 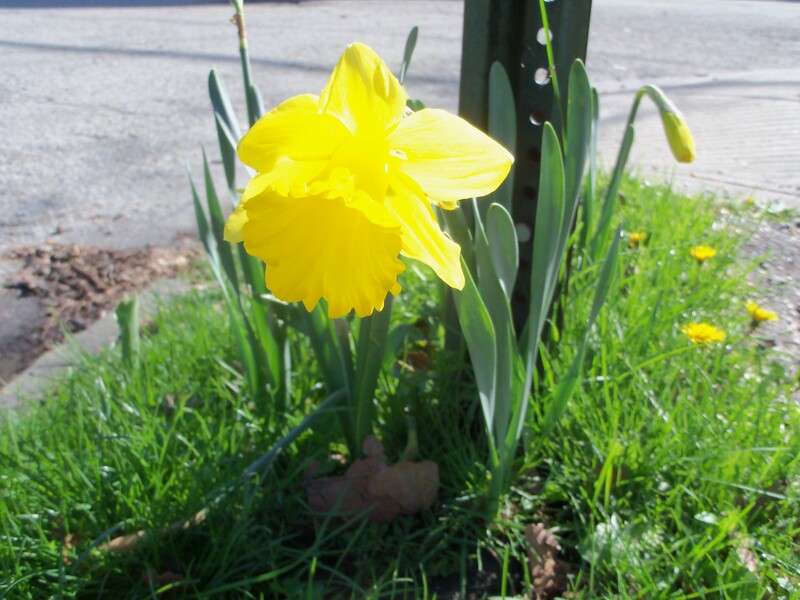 One of the most common dermatitis problems for florists is daffodil itch, some cultivars are known to be a little more irritating than others… Gloves should typically be worn, especially if you have sensitive skin. Hosta is a genus of 23 – 45 species of plants commonly known as hostas, plantain lilies and occasionally by the Japanese name giboshi. 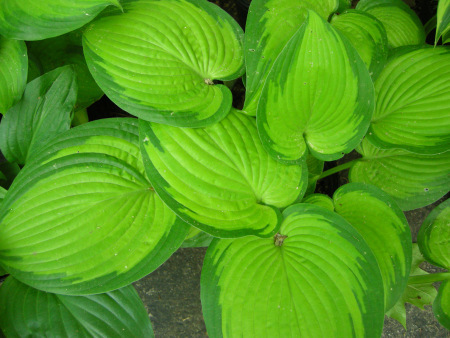 Hostas are cultivated as shade-tolerant foliage plants. The genus is currently placed in the asparagus family. Like many monocots, the genus was once classified as a lily.Depending on who you ask there are between 4,000 and 40,000 cultivars of Hosta, with the actual number falling somewhere in the middle. Hosta can survive in heavy shade and are also rather drought tolerant plants, I commonly recommend them under pine trees… As long as you water a hosta through the first year of establishment, it will survive just about anything nature can throw at it… Hosta also tend to have pretty strong root systems, because of this they can be handy plants for use as erosion control. A potexvirus called Hosta Virus X has become common recently, and plants that are infected must be destroyed as the disease can be transmitted from plant to plant by contaminated sap. Symptoms include dark green “ink bleed” marks in the veins of yellow-colored leaves, and/or tissue collapse between veins. It can take years for symptoms to show, so symptom free plants in infected batches should also be considered infected.